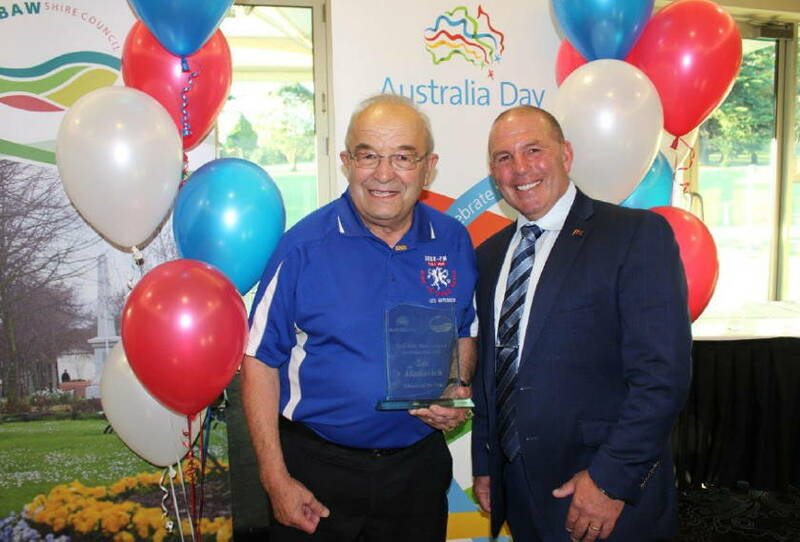 Les Matkovich named Baw Baw Shire Citizen of the Year 2017 – West Gippsland Community Radio Inc.
Les contributes a wide range of practical skills to the upkeep of the station, and liaises with the landlords of the premises, and the transmission tower site. When a difficult or unpleasant job has to be done, such as removing the corpses of possums and rodents, or running cables through the ceiling space, it’s he who steps up to do the job. He has been an active participant in all refurbishing projects, and the project to make the studios compliant with sustainability standards. He accepts invitations to speak to local groups such as Probus, Rotary, Apex, and Lions, promoting 3BBR-FM; compered Jindivick Community Flower Show for several years, Neerim South Carols in 2014, 2015 and 2016; and the Show Personality event at Neerim South Agricultural Show in 2016. He has run several successful fundraisers, particularly Film Nights, and has been present at every promotion stand and Open Day since 1993. He is ‘on call’ for problem solving at the studio at any time of the day or night, and has recruited many new members to 3BBR. While his dedicated service to 3BBR consumes his life, he has been generous with his time with other local groups in the community, in particular offering governance advice to the Drouin Play Group, Warragul Theatre Organ Society and Drouin Senior Citizens, where he chairs their AGM. He is a very kind and generous man with his time, quietly supporting members through times of stress, bereavement or ill-health. When a member who had become to some extent estranged from his family was in palliative care, it was this man he called upon for support, and he visited the member every day until his death. The station is affiliated with CBAA, CBAV, and SCMA, and Les attends their conferences and AGMs whenever possible. In 2013, he attended a Technorama conference, He is constantly learning new skills, and updating knowledge of the operations and governance of community radio. If basic equipment repairs are needed, he has learned to carry these out. He has completed units in Certificate 3 Radio and is qualified to carry out Testing and Tagging. He has researched and completed funding applications to CBAA, Federal, State and Local Government Grants, most of which have been successful, including applications to the Community Bank for funding to convert the bathroom to a disability toilet, and for a new broadcast console in the Production Studio.